Chicago is definitely a happening town for bloggers as my virtual book tour takes me there again today. While in Chicago, I have had the pleasure of meeting David, Andy, Wendy, and, next week, Scharlene. Today, I’m chatting with Liz Strauss, the owner and writer of Successful-Blog. Today’s chat is slightly different from my previous interviews; although we chatted today, Liz will post it as a series of mini interviews next week. I will announce them here once Liz posts them. Thanks Liz! 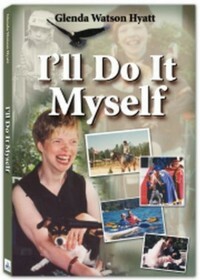 With all these connections in Chicago, what are the chances one knows a Harpo security guard, janitor or mail clerk who easily slip a copy of I’ll Do It Myself onto Oprah’s desk? Hmmm. Will the Law of Attraction work? Stay tuned! What fun that I’ll get to spend a week with you on my blog, now that I already have spent several days in my email box conversing via email! I have such broad, deep round, tall picture of you from all of your interviews. I hope you’ll start a press room page with links to your interviews so that when the NY Times and the Wall Street Journal come looking they’ll have everything at their fingertips. Funny, your comment about Oprah. I tell people that from blogging I feel like I could get in touch with almost anyone on the planet within 1 week — except Oprah. 🙂 I say that all of the time. I understand exactly what you’re talking about. If that ever changes . . . you’ll sure know. Can’t is not a word that one can associate with Glenda. She is the most “gutsy” woman I know. I would be impressed by her accomplishments if she didn’t have CP but given she does I am even more at awe by what she has done in her life. The best part is she’s just begining. We haven’t seen nothing yet. I am honoured to call her friend and am very proud of her ability to set a goal (huge one at that) and accomplish it so beautifully. Her book is an inspiration to all. You go girl! !